The LumberKings lineup for the national anthem before a game in Peoria, Illinois, against the Chiefs. Clinton, IA (September 17, 2018) - Another summer has come and gone and with it the 63rd season of baseball for the Clinton LumberKings in the Midwest League. Looking back on the 2018 campaign, the LumberKings fit the trend throughout professional baseball of home runs and strikeouts, a combination that led to a near playoff berth in the first half of the season. The season got off to an ominous start with the LumberKings traveling to Kane County to open the season at Northwestern Medicine Field. 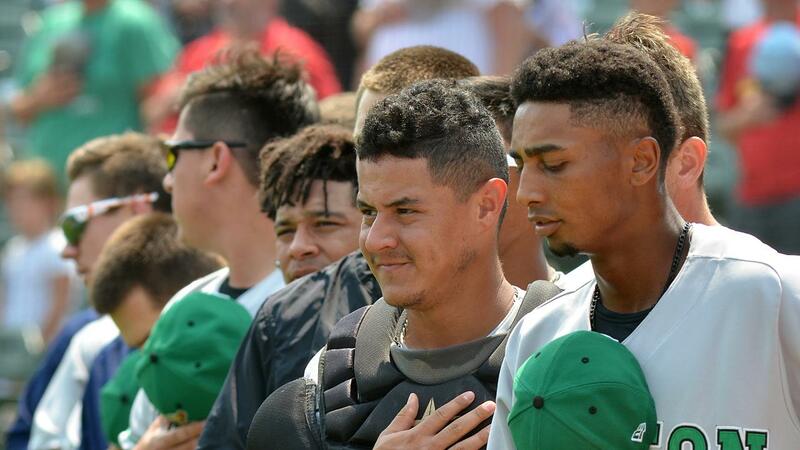 After two days in Kane County, the LumberKings returned home without having played a game. Cold temperatures and snow is what many fans will remember from April 2018 as the LumberKings lost five games in the opening month due to inclement weather. By season's end, Clinton had played in eight double headers and excelled in the double dips. Over their 16 games played in doubleheaders, the LumberKings were 11-5 with .688 winning percentage which was the third best in the Midwest League in twin billings. The amount of doubleheaders hit a crescendo on the Memorial Day weekend in Cedar Rapids when the LumberKings met the Kernels for back-to-back doubleheaders. The first double dip came on May 26th with Clinton making history. Over 14 innings of baseball, the LumberKings bested the Kernels in both contests for their first doubleheader sweep in Cedar Rapids since May 2nd, 1999 and first ever at Perfect Game Field at Veterans Memorial Stadium. By the final week of the first half, the LumberKings were counting down to a playoff appearance and likely division title. Following a sweep of a doubleheader of the Kane County Cougars on June 10th at Ashford University Field, the LumberKings sat in first place by two games with seven games left to play. The lead was then squandered over a five-game skid that included the first of two three-game sweeps in Quad Cities by the River Bandits. The house of horrors that was Modern Woodmen Park was a place of frustration for Clinton as they ended the season 0-6 in Quad Cities in 2018. Thus joining, the 1967 Clinton Pilots as the only team that failed to win a game in Davenport over the course of a season. Following the sweep, Clinton no longer controlled their own destiny. A series opening loss in Beloit on June 15th eliminated them from wining a division title. Still, the LumberKings came back to win the following night and came into the final game of the half in a tie with the Peoria Chiefs for the wild card. A LumberKings win and Chiefs loss to the Kernels would have meant playoff baseball for Clinton. Beloit jumped out to an early 4-1 lead on the LumberKings setting the back drop for one of the most dramatic comebacks of the season. After pulling to within two runs in the seventh inning, LumberKings slugger Ryan Costello hit a two-run homer in the top of the eighth to tie the score at four. The Snappers then stormed back to reclaim their lead with a run in the bottom of the inning. Trailing 5-4 in the top of the ninth, and down to their final out with the bases loaded, Costello hit his second home run of the game - and first grand slam of his professional career - to straight away center field to give Clinton an improbable 8-5 win over Beloit. The triumph kept the LumberKings playoff hopes alive but just for a matter of minutes as the Kernels fell to the Chiefs. The first half ended for Clinton in a tie with Peoria for the wild card with the Chiefs advancing to the playoffs due to a tie breaker. Following the game, the LumberKings went into the All-Star break with four All-Stars. Costello joined teammates Ryne Inman, Collin Kober, and Jack Larsen to be selected as Western Division All-Stars. Larsen represented Clinton as a starter but did not participate in the All-Star game festivities in Lansing due to an injury that had sidelined him through the final week of the first half. The LumberKings came into the second half with a far different team than the first. Opening Day pitcher Nick Wells, in his third season with the LumberKings, earned a promotion to the High-A Modesto Nuts along with infielder Louis Boyd and catchers Nick Thurman and Ryan Scott. In corresponding moves, Clinton received Nuts pitcher Randy Bell, catchers Juan Camacho and Rainis Silva, and the first of four Seattle Mariners 2018 draft picks, infielder Zach Scott and outfielder Keegan McGovern. McGovern made an impact immediately for the LumberKings as one of the most productive Mariners prospects taken in the 2018 draft. The University of Georgia product, despite a late start to the season and appearing in only 65 games, ended his year with 15 home runs including his first multi-home run game on the final day of the season. His success was acknowledged by the Midwest League towards the end of July when he was named Player of the Week for July 16th through the 22nd. By season's end, McGovern out slugged every other 2018 Mariners pick. As a Mariners affiliate run by one of the most aggressive General Managers in all of Major League Baseball, Jerry Dipoto, the LumberKings found themselves involved in a handful of trades in 2018. The first of the trades involved right-handed pitcher Tommy Romero who was sent to the Tampa Bay Rays. The Rays assigned Romero to the Bowling Green Hot Rods where he ended his season as an All-Star with the second lowest ERA in the league, 2.95, and the lowest opponent batting average, .238. Ryan Costello, next to be packaged in a trade, moved in a deadline deal to the Minnesota Twins on July 30th. At the time of the trade, Costello was leading the league in home runs, 16, extra base hits, 42, and RBIs, 70. Two days later Costello's roommate, Jack Larsen, earned a promotion to the Modesto Nuts, leaving Clinton with just one of their all-stars, Ryne Inman. By August, the LumberKings were 7.5 games back, in seventh place in the Western Division, and approaching a historical mark. This season, at every level of baseball strikeouts have dominated the game. Major League Baseball will set a new record for strikeouts for the 10th straight season with the Houston Astros on pace to pass the 2013 team strikeout record set by - wait for it- the Houston Astros. The LumberKings were no different. By the end of August, Clay Chandler, Ray Kerr, Ryne Inman, and Sam Delaplane were fast approaching 100 strikeouts on the year and closing in on a combined team strikeout record. On August 26th during a Sunday matinee at home, Inman made history by striking out Gilbert Lara in the top of the second inning. Although strikeout records have fallen with great frequency in professional baseball, the LumberKings 2018 achievement broke a record that had stood for over 30 years. By season's end, LumberKings pitching had combined to strikeout 1,263 batters to set a new franchise record, passing the 1987 Clinton Giants strikeout total of 1,188. The total was not good enough to lead the league as LumberKings pitching fell 251 strikeouts short of the Quad Cities River Bandits 1,514 that led the league and set a new Midwest League record. Baseball's dramatic shift toward the two true outcomes, strikeouts and home runs, have become more pronounced over the last 10 seasons. Clinton batters slugged a total of 108 home runs to mark just the fourth time in franchise history that a team had hit 100 or more home runs. The last time a LumberKings team had more than 100 home runs was in 2010 when Nick Franklin led the way with a franchise record of 23 long flies. The 2018 season came to an end in Burlington with a pair of wins over the Bees, September 1-2. Rain on September 3rd prevented the final game of the year from being played, denying the LumberKings a chance to end the season with a .500 record. This was a fitting end for a season that featured weather in a starring role. As a result, the LumberKings ended their year going 69-70. For the second straight season, Clinton failed to make the playoffs meaning another year without a championship. The last title for Clinton was with the 1991 Clinton Giants, thus making the LumberKings current drought the longest in the Midwest League. On April 4th in Geneva, Illinois, the LumberKings will be back in action to open the 2019 season with the Kane County Cougars and with it their 64th year in the Midwest League as the only remaining charter member.